Money has been accused of a lot of things over the years, most of them not very pretty. Part of the reason I sold my soul and went to business school after a few years of community organizing was that I recognized the fundamental role money has played in making the world the way it is. I figured if you want to change the world, best to understand one of the most powerful forces shaping it. What I learned is that money is just a tool, and the root of all evil can sprout more benevolent blossoms. 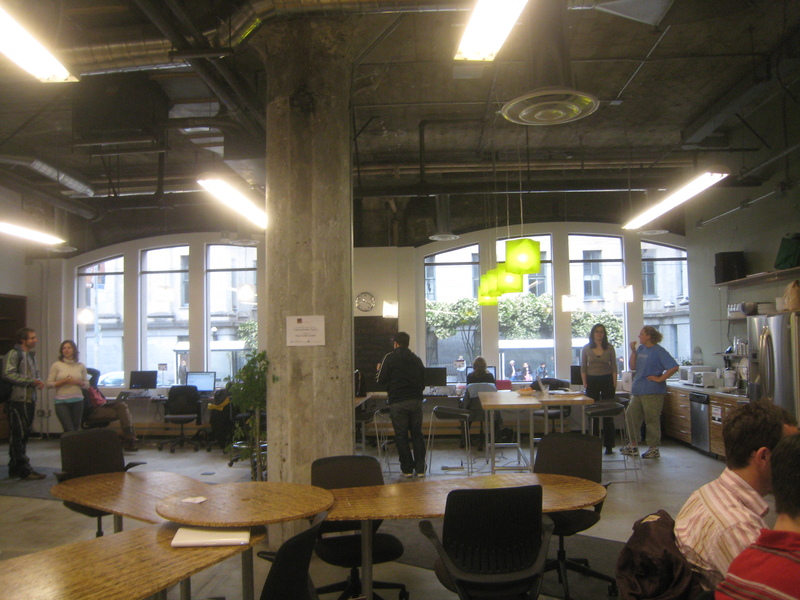 In the hands of a Hub member, for instance, money becomes an accelerator of social change. Here at the Hub we like social change, so we’re offering a workshop designed to get more money in the hands of people like you. Next Tuesday (July 20), New Resource Bank founder Peter Liu has graciously offered to teach a workshop to Hub members and other green/social entrepreneurs about best practices for raising capital. Peter raised a total of $25M to launch New Resource Bank in 2006, which is one of the largest-ever initial capitalizations for a new bank in Northern California. He serves on several non-profit and foundation boards and was on the clean technology investment advisory boards of the California Public Employees Retirement System. In this interactive workshop, Peter will draw from his extensive experience as an investor and entrepreneur who has raised money from friends and family, angel investors, VCs and banks, to help you figure out when, how, and from whom you are most likely to be successful in finding funding. Alternatively, if you find yourself on the other side of the spectrum with money to invest, check out Timothy Yee of Green Retirement Plans and Geoff Ashton of Calvert Investments during a brown bag lunch this Friday on using your investments to influence corporate America. It’s all about the money, people. The sooner we recognize that, the sooner we can focus on the more important things in life. 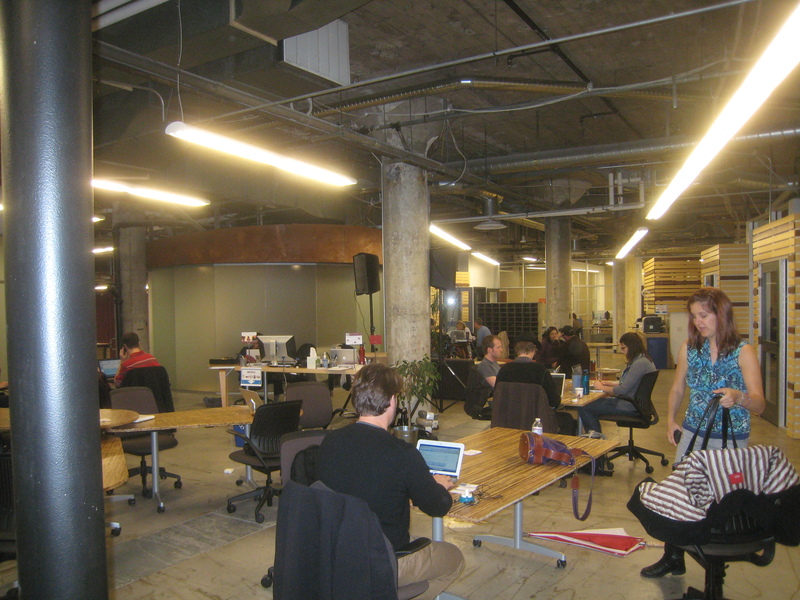 Hub SoMa’s First Day – Radical Collaboration Begins! 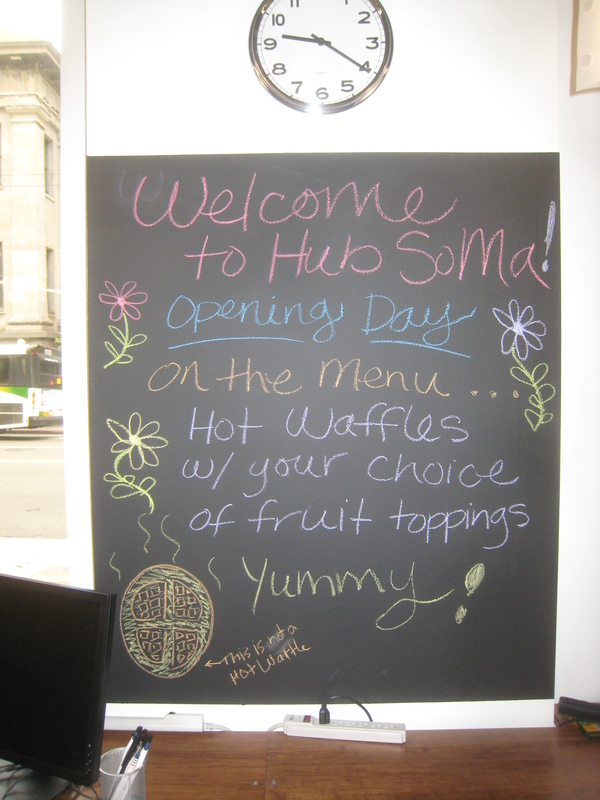 The smell of hot coffee and waffles inspired our members as they arrived for their first day of work at our new SoMa location. It was a busy day for the Hub staff with over 50 members in the space from organizations such as Change.org, International Futures Forum, Feel Good World, Mercy Corps, Adaptive Edge, Reach Global, and Red Magnet Media to name a few. Radical collaboration happened in the flesh at Hub SoMa yesterday and we are very excited to see all that transpires in our first few months. 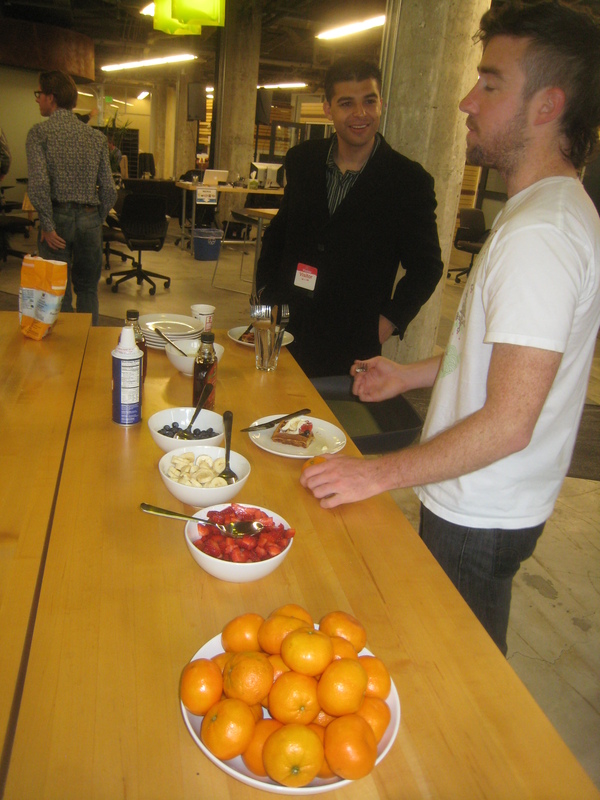 Jocelyn Wyatt of IDEO gave our first brown bag lunch, and we had deliveries of Numi Tea, and Adina beverages are flowing. Just a few perks our members enjoyed along with our non-stop caffeine fix courtesy of Equal Exchange! Our partner Intersection for the Arts continued installing their exhibit “Let’s Talk of a System” and will be opening their space to the public May 19th at 6pm. Come visit us in the new space! If you can’t make it before May 27th, join us at our launch party to see our vision come to life. On Friday, don’t miss a Brown Bag lunch with Jean Russell, curator of Thrivability: A Collaborative Sketch (http://thrivable.wagn.org/wagn/Slideshow). Jean will present and discuss flash collaboration. She used this process to involve 70 collaborators from across the world in producing an ebook in less than 90 days. The ebook was repeatedly a top “twittered” and “facebooked” item on Slideshare. It is approaching 5000 views in less than 3 weeks. It is cash positive on a generosity model. She will point to successful ways of using social media to both develop and launch a project, as well as project management for flash collaborations. Take away ideas on how to collaborate with your network for tangible and visible results. Please RSVP to me at meredith.walters@the-hub.net. We are starting a new series of the blog, Hub Collisions, to highlight the stories of members who have created amazing new organizations and ventures through collaboration and networking at the Hub. We felt it was important to take a step back ,occasionally from the daily commotion, and see the bigger picture of what the Hub is all about. If you would like to share your own story please email the author of this blog (hub.rrichamathur@gmail.com). We will be kicking off this segment with a feature on Hub member: Jenny Kassan. Jenny is an attorney working with Katovich Law Group, and first came into the Hub for a Numi tea event soon after the Hub opened. She met Alex (our awesome Managing Director) and was introduced to other members and staff. Inspired by the space and the goals 0f the Hub, Jenny and her colleague Rick Randel organized the Cutting Edge Capital Raising for Small Businesses-Existing Options and a Policy Agenda for the Future event here that was hugely successful. More than 60 people were in attendance and a great network was formed. Wish Fundraising was Easier? Introducing CauseShare! Fundraising is tough, but it is also a great opportunity to bring together the people who care about what you do everyday. Dave Adams, a member of the Hub recently launched CauseShare, a new online fundraising tool that was designed to help people and small organizations with big ideas bring together their community to raise money online. A fundraising campaign on CauseShare gives you and all the people who care about what you do a CauseShare page, equipped with commerce and sharing tools that helps great people become great fundraisers. Learn more about it by watching Dave’s interview below. Way to go Dave! We wish you success with your new venture.